GET A BROCHURE CONTACT US NEW PRODUCTS! * Keep water running through the headers by keeping the RPMs high which means when idling, punch the throttle frequently to push water though them. * Water should be entering the headers at 1800 RPMs, no less. * Water entering later than 1800 RPMs will cause bluing and discoloring. * The richer the motor, the longer the headers will last. The inside of the primary pipes should be dark brown to sootie black. If the insides are light brown to white, you are running too lean. The problem is in the headers, not on the spark plugs, so check inside the headers, not by the spark plugs. The area close to the heads on the pipes should be blue. A green color means you are running your engine lean and could warp the pipes. There is no warranty on leanness related conditions. Remember, there should be no whiteness at all. * Spray WD-40 after each use. When the boat is stored after your outing, at the end of the weekend, at the end of the season, etc, whenever it is not going to be used for a couple of days, you need to spray WD-40 or some other related oil on the headers to help prevent rusting. If you are going to be using the boat continuously for a couple of days, then you do not need to use the WD-40 each day. This is only at the end of the outing when it will be sitting and not being used. Spray the WD-40 in between the pipes and the back side of the headers, on the flanges and where the primary pipes join the collectors, into the weep holes, and into the collector. This will help prevent rust. Even though nickel gets between the pipes, the chrome does not and thus the rust will occur if the headers are not taken care of properly. * To get rid of rust, use fine steel wool, then spray with WD-40 again. * BEFORE you use the boat each time, you need to clean off the WD-40 with Windex before you fire up the motor and get the headers hot. You also need to use the Windex each day right before you start the boat to wipe down any oil, fingerprints, suntan lotion, etc that could have gotten on the headers. The oil from these types of things can burn into the chrome when the headers get hot. * After Loading the boat on to the trailer, run the motor for 30-60 seconds to dry the inside of the headers. This will also help keep your headers from rusting. * The chrome plating on the water injected headers is the finest quality triple chrome plating. But running headers dry for a long period of time will yellow and blue the headers at the ends. Yellowing and bluing is a discoloration of the chrome due to heat. So, if you are running the boat on a trailer, it will overheat and yellow. You must have the boat in the water, running water through the motor at high RPMs. That means that you can also get yellowing if you are idling. So, if you put the boat in the water and then start it and idle it, it will overheat and yellow. So, keep idling to a minimum. If you are idling for awhile, just be sure to hit the throttle every once in awhile to get the RPMs up there and that will add water to the headers. Just punch it frequently. * Clean the headers with Windex often as possible and before you use the boat each time. * Put WD-40 on the headers after your outing when you store the boat. * These are suggestions only and are not guaranteed to stop the rust and yellowing, but based on our experience, they help significantly. * Headers are Dry at idle & Wet above 1800 RPMs. Your headers should be hot and dry at idle. They are also hot the first 6" out from the head to the water inlet fitting and the chrome will blue to this point. * Never let a passenger or skier climb in or around the headers. They may get burned. * The water goes into and out of the motor by means of an overboard by-pass line. The water from the motor is then injected into the header at approximately 1800 RPMs when you are on the throttle. When you back off of the throttle lower than 1800 RPMs, then the stainless steel automatic control valve should close and the headers should go dry. When you get back on the throttle over 1800 RPMs, then the water should automatically be injected back into the headers again. If it does not work in this manner, then something is hooked up incorrectly or your valve is plugged. * If your water injection system is not working properly, stop and fix it. If you run with the system not working properly, it can cause hydraulic of the engine. If your lines or valves are plugged, remove and blow out the lines. Make sure that the small holes on the bottom of each pipe are not plugged. Clean the valve and make sure that it is assembled exactly the way it came apart. The valve is made of the finest 316 stainless steel. It is the most corrosive resistant of the stainless steels on the market. Periodically spray inside the valve with WD-40. * When you need to work on your boat out of the water it is very important that you run water through it. Running water from a garden hose through your engine and headers is a two man job. Turn on the water from the hose only after the engine is started and the RPMs are held over 1800. Turn the water off before you drop the RPMs and turn off the engine. You may have to close the by-pass valve by hand in order to make the water go through the headers. Make sure that the by-pass valve is returned to the original setting. * Install stainless steel lines to headers. * Install headers on engine. * Make sure there is no thermostat or any other type of water temperature control in the housing. * Install "T" stainless steel control valve in one of the two lines in the thermostat housing. Connect the "T" end to the headers. The lines of the headers should be approximately 2 feet long. * The other line from your thermostat housing is the by-pass line. Run it overboard with a 1/2" brass gate valve (plumbing type). * The gate valve is needed to regulate the amount of water you discharge. It also regulates what RPM the water is injected into the headers. 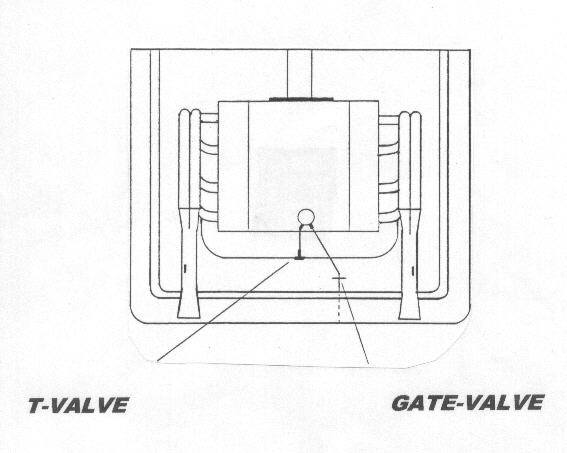 Example: gate valve is open and water comes in at 3000 RPMs. In order to make the water come in at 1800 RPMs, close the gate valve approximately 1/3. * Most likely, the headers have experienced a leanness condition at one or more times. Leanness means that there was not enough gas mixing with the amount of air coming through the carbs. In order to solve this, you need to fatten the carbs primary and secondary. Make sure that the timing is advanced. To detect leanness, you would notice that the inside of the header at ports would be white, you are constantly blowing gaskets, there is a green or gray color in between the heads and water injection, and bluing farther than the water injection. More or less water is not going to fix a leanness problem. * Yes. If you have an overlapping cam, the cam will actually pull water into the cylinders. In most cases, the water will pass by the pistons or valves and end up in the oil pan. So, it is important that you check the water system each time you start the motor. Tons of water should not be coming out of the weep holes at idle. The bigger the overlap of the cam, the later you want the water to inject. However, the bigger the cam, the later the water injects, and the bluer the headers. * You need to set the temperature at idle. After that the running temperature is beyond your control. If you would rather have good engine temperature, you need to purchase a thermostat kit. Remember that changing the engine temperature with the gate valves will change when the water injects to the headers. * Make sure that the motor is not running lean. Check the carbs at the primaries and secondaries. Bolts may be vibrating loose. Bassett Racing offers tall lock washers to help prevent this. Putting a thin coat of RTV on both sides of the gasket will help. After installing the header, tighten to where the RTV is just oozing out, then wait 12 hours and then torque down. Usual amount is 25 pounds. Now you have created a silicone rubber gasket. * The headers are steel and they will rust if you do not put oil on the headers while in storage. Some of the conditions that contribute to rust and corrosion are humidity, condensation, wet seats, water in bilge, water left in injection lines, and water left in top of the t-valve. In addition, if the battery is leaking, the acid vapors will rust the headers. Thus, it is very important that you put a good oil such as WD-40 or LP-1 all over the headers, in the collector, and in the weep holes. Remember to wipe all of the oil off with Windex and paper towels before starting the motor or you will burn the oil into the headers and that will yellow the headers.